JULLOUVILLE PINS. VILLA KER CATHERINE. Property 1: JULLOUVILLE PINS. VILLA KER CATHERINE. Jullouville, Villa 200m from the beach, close to shops. Comfort and relaxation! Property 4: Jullouville, Villa 200m from the beach, close to shops. Comfort and relaxation! Super comfortable villa with heated pool near Mont Saint Michel. Property 5: Super comfortable villa with heated pool near Mont Saint Michel. VILLA CAPRICE Ground floor, 7 people, TT comfort. 2 stars. 50 m from sea Mt St Michel Bay. Property 34: VILLA CAPRICE Ground floor, 7 people, TT comfort. 2 stars. 50 m from sea Mt St Michel Bay. L'Arbolière property between sea, city and countryside. Property 47: L'Arbolière property between sea, city and countryside. We enjoyed our stay in this small French home overlooking the idyllic marshes near Mont St. Michel. The view of the island through the misty sea air was incredible! The home was off the main roads to ensure privacy and solitude which was well needed after our five days in Paris! The home is typical of the area, warm and cozy. We recommend staying at least two nights, the first to enjoy the evening, then tour Mont St. Michel, and the second to relax and reflect on the day. 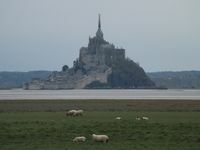 We spent a week visiting Mont Saint Michelle and Normandy with my family. The home was perfectly located to act as a home base for us to go on our daily adventures. Winding down at the end of the day with dinner in the side yard with that view, created memories we will never forget. The home is huge, and allowed all of us the ability to have some alone time during the vacation. Such a beautiful house, with kind hosts. I would definitely recommend anyone to stay here to spoil themselves while one vacation.